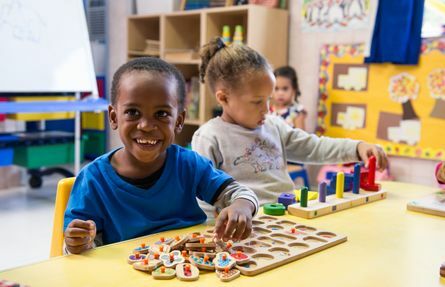 Kiddie Academy II bases its child care curriculum on the Montessori model, encouraging creative stimulation through interactive hands-on activities and exercises. As more and more Bermuda parents realize the benefits of this model, we continue to inspire our kids with a syllabus that truly makes learning fun! For information on admission and fees please visit our Admission & Fees page. Each baby will have his or her own crib which will be supplied by the school. The parents will be responsible for supplying the crib sheets for their child’s crib. Two sheets should be supplied at the beginning of each week. When one has been soiled, it will be sent home to be laundered and we ask that you supply us with a replacement supply the following day. You will also need to supply pre-made bottles of formula for the entire day, and any food that your child may require for lunch or snack. The staff will wash the bottles after each use, but sterilization of the bottles will remain the responsibility of the parents. We ask that you kindly label all articles of clothing, linen, food and bottles, diaper, wipes etc. We will have a marked station for your child’s diapers and any other supplies that you wish to send for your child, i.e. lotions, powders, wipes. etc. We will have your infant care provider available from 8:00 a.m. each day, for your convenience. She will remain on the premises until 5:30 p.m., so please be punctual when picking up your child at the end of the day. This will enable us to provide the proper supervision of all children, at all times. We ask that you send an extra set of clothing, and the required amount of diapers / pull-ups for your child at the beginning of each week. Please ensure that all articles of clothing are clearly labeled and stored in a drawstring bag to hang on your child’s hook. You will also need to provide a towel for nap-time. This will be placed on top of the cots for sanitary purposes. In this class we will be providing the children with an environment where each child can learn naturally and freely at his or her own pace. The activities will include practical life, sensorial, movement, language development, and development of their social skills. Personal care (washing hands), practical activities (pouring dry materials, lacing or stringing), courtesy (when to use our quiet or loud voices), and snack distribution / sharing, manners, greetings. We will also be developing awareness of the senses. A few examples would be: for sight (shape and colour sorting or matching), for touch (rough or smooth), for sound (identification of sounds of objects in the environment), taste and smell (using fruits and vegetables). The activities to develop coordination and strength will be walking, running, stair climbing, lines, and balls. 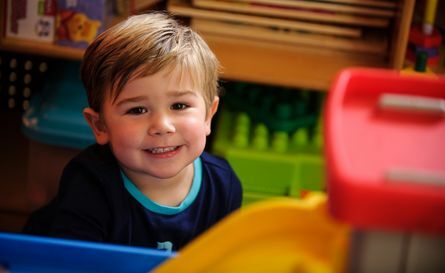 Through clear speaking to the children, story telling, singing, and rhymes, we aim to promote their language development. 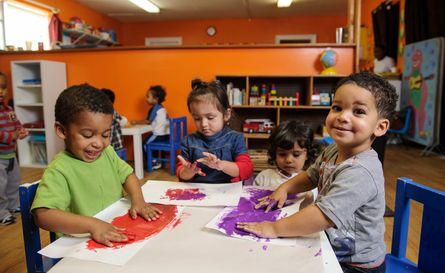 In this class we will also be providing the children with an environment where each child can learn naturally and freely at his or her own pace. The activities will include practical life, sensorial, movement, language development, and development of their social skills, etc. 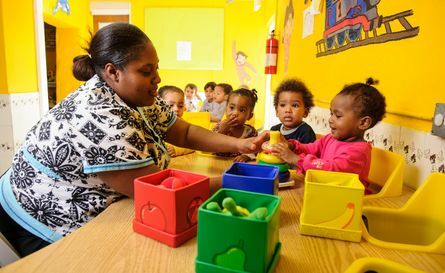 At this stage it is very important to promote their fine motor skills, and develop their attention spans. In this class the majority of their teachings will be with the Montessori Practical Life and Sensorial activities. This will enhance their ability to eventually hold and use a pencil with good muscle control, and allow them to concentrate on an activity or a lesson with great maturity. Number recognition, shapes, color reinforcement, and phonetic letter sounds will also be introduced to them at this stage. In this class the intent is to foster independence through several exercises whereas the children will basically be imitating adult tasks (doing it myself philosophy) i.e. pouring the water, buttoning or fastening clothing, carrying items. 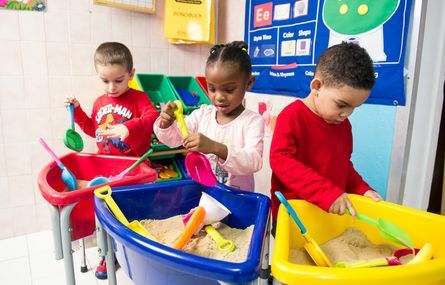 We will start off by reinforcing what they have already learned in the toddler and transition classrooms,then move on to activities which will complement and extend these skills, and enable the children to better understand their world and their place in it. 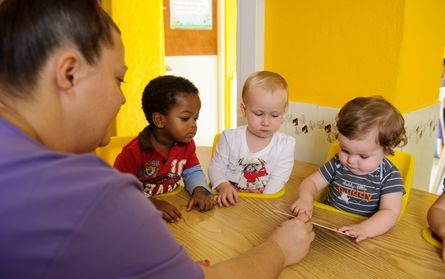 The emphasis that had been placed on developing theirfine motor skills will be utilized at this time, and they will soon have enough strength to control a pencil with such skill, and be able to start writing words and numbers. We will continue with several Practical Life Activities (i.e. squeezing, stirring, spooning) to enhance muscle strengthening. At this stage in his/her life, your child will become more sociable, articulate and better coordinated. They will love the world of pretend. Their hand and finger control are improving, together with their wider understanding and imagination. This will enable them to enjoy things like painting, model or block building, and rod stacking etc. We believe that with helpful interaction and instruction, and lots of praise and encouragement, we can make this an enjoyable time in their lives. 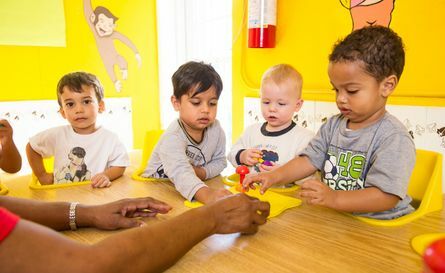 They will also be learning phonetic letter sounds through listening and seeing, and letter recognition, simple math techniques using the value of numbers will develop recognition of numbers. An introduction to simple musical instruments will help them to recognize different sounds.